The Chicago Cutlery Fusion 3-1/2-Inch Paring Knife precisely trims away the skin of fruits and vegetables so that you don’t waste the fruity, juicy flesh inside. High-carbon stainless steel blades resist rust, stains, and pitting, while the exclusive 25-degree Taper Grind edge provides optimum sharpness. Non-slip cushion grip handle provides a comfortable, sturdy grip and stainless steel plates at the end of the handle lend a sleek, contemporary style. The forged design adds increased weight and balance giving you the confidence that comes with complete control. Chicago Cutlery's Fusion 3-1/2-Inch Paring Knife comes with a full lifetime warranty. Hand washing is recommended. Chicago Cutlery Fusion 3-1/2-Inch Paring Knife precisely trims away the skin of fruits and vegetables so that you don't waste the fruity, juicy flesh inside. High-carbon stainless steel blades resist rust, stains, and pitting, while the exclusive 25-degree Taper Grind edge provides optimum sharpness. Non-slip cushion grip handle provides a comfortable, sturdy grip and stainless steel plates at the end of the handle lend a sleek, contemporary style. Forged design adds increased weight and balance giving you the confidence that comes with complete control. 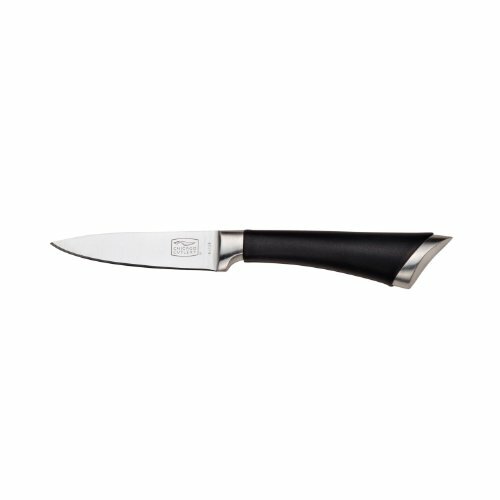 Chicago Cutlery's Fusion 3-1/2-Inch Paring Knife comes with a full lifetime warranty. Hand washing is recommended.